At the grocery store the other day I came across some coconut almond hummus. I was intrigued. Reading the ingredients, I noticed that the last ingredient listed was love. That’s right, love. I found that wonderfully bold and it got me thinking. To my knowledge the United States Department of Agriculture does not have recommended dietary allowances for nutrients such as love, beauty and joy. They would probably laugh at the suggestion and in all honesty, I wouldn’t want them or any other agency to quantify these intangible nutrients. But the fact remains that you do need these nutrients along with protein, carbohydrates, fat, sodium, iron, calcium, vitamin C and everything else listed in the nutritional facts on packaged foods. When I’m hungry, I have lots of choices. There have been times when I’ve reached for a bag of chips, a quick fix in the moment. The hunger pangs disappear as I eat the chips and I enjoy that satisfying crunch, but I don’t feel truly nourished by them. When I choose instead to make a fresh garden salad, it’s a different story. In addition to the nutrients in the salad, I am nourished by taking the time to prepare it, by making the choice to honor what my body needs. Just as with food, some objects are more nourishing than others. You may not find love, beauty and joy mentioned anywhere on the label or packaging, but I believe your heart knows when they are present and when they are not. Even if you are not consciously aware of it, you experience the benefits. I may not taste the love the way I taste the cumin that gives that hummus a surprising kick, but I am fed by it nonetheless. You feel special when you use a handwoven towel. It has to do with the human connection between people. When you use beautiful things made by people with love, you invite that love into your life, bring it into your home. When you are truly nourished by the foods you eat, not only do you enjoy them more, but you many find that you eat less. You may also discover that you need fewer things when you choose ones that delight you and nourish your soul with beauty, love and integrity. In our world with so many choices, it’s important to choose objects that nourish you deeply, especially at this time of year when you are buying gifts for family and friends. I believe that at the heart of the holiday celebrations and traditions is a desire to connect with others and to express love. Gifts — be they purchased, found or made — are one way to express love. They are not the only way, but they are a significant way. I was given a Whimsy & Tea kitchen towel as a gift. At first I saved it for best. But one day when I was desperate for a clean towel, I used it. 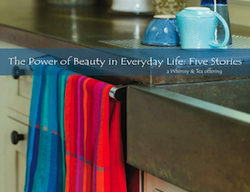 I discovered that your towels are not only beautiful, they are incredibly durable, functional, and amazingly absorbent! I love things that are handmade with care, attention and intention. Your towels have a very sweet energy to them and that energy carries through and enhances the warmth and comfort of my kitchen. Things made with love do nourish you deeply. Whether you buy your gifts or make them or opt out of gift giving entirely, I hope you’ll remember to add the ingredient of love to everything you do this holiday season and see how connected you start to feel with the people you care about.